Looking for something to occupy your time during the winter months? Susun's online courses are a fun way to learn how to keep yourself and your family healthy and happy, the Wise Woman Way. Easy video based courses. No testing, no effort, just watch, listen and learn. A fast, easy way to incorporate herbal medicine into your life! Easy Herbal Medicine & Natural Remedies: - New short videos and audios each week totaling less than 30 minutes, for a fast, easy way to incorporate herbal medicine into your life. Susun talks about harvesting roots, shows us dandelion roots and leaves. 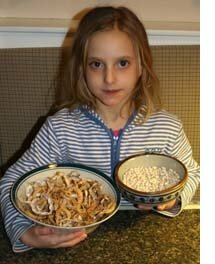 She then shows us how to prepare the roots for tincturing. Dandelion root tincture is great for digestion and more. Part of Susuns new course, 'Easy Herbal Medicine & Natural Remedies in under 30 minutes per week!' New short videos and audios each week, for a fast, easy way to incorporate herbal medicine into your life. Plants from the woodland garden, stars of holland, chickweed and cleavers. Chickweed is nice in salads, great as a tincture, and oil also. Cleavers is lymphatic mover. New short videos and audios each week, for a fast, easy way to incorporate herbal medicine into your life. Susun shows us Jewelweed, which counters inflammation, especially poison ivy. chemotherapy while reducing side effects, and protect you from surgical aftermaths. To help you decide if alternative cancer treatments are for you, Susun highlights some that often work and some which rarely do,with a detailed look at herbal chemotherapies, medicinal mushrooms, and adaptogens for long life. Includes a trip to China Town, and hands-on preparation of herbal teas, infusions, tinctures, and vinegars. 13 Chapters plus additional bonus content. 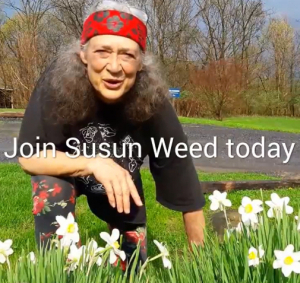 Join Susun Weed for a Free Teleseminar! Zsuzsanna Budapest - "grandmother of the goddess movement" - has led rituals, lectured, taught classes, given workshops, written articles tirelessly, and published in hundreds of women's newspapers across the country for many decades. She has powerfully influenced many of the future teachers and writers about the Goddess. Z, wrote The Holy Book of Women's Mysteries which was originally published in 1975 as The Feminist Book of Lights and Shadows. This book served as the first hands-on book to lead women into their own spiritual/Goddess heritage. Free Teleseminar tomorrow, 8/21/2014, at 9:30pm EDT. with Thea Summer Deer and Susun. Draw on the wisdom of Chinese Five Element Theory to explain the main functions of the spleen, pancreas and stomach and their relationship to the Earth Element. When you register you will receive a coupon code for Theas WiseWomanUniversity.org class. Support Your Kidneys this Winter for Optimal Health! reveals what could not before be seen. guides me west, and home at night. 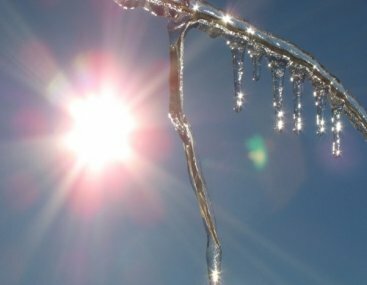 We welcome winter solstice with its breath of cold demand. where I may join her in my dreams. and reveals what could not before be seen. 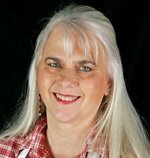 Join mentor Thea Summer Deer for her course Hidden Treasure: Kidney Essence & The Water Element. It will benefit herbal practitioners at any level, and individuals who want to understand the vital role of Kidney Essence and how to achieve optimum health and longevity. There is no better time than now, at the turning of the ages to study our relationship with the Water Element, restore our kidneys, and move beyond fear as we gain wisdom. • To have a basic understanding of how the kidneys function and to increase awareness around the urinary tract system that includes the adrenals. • To begin to look at Kidney Imbalance from the perspective of Chinese Five Element Theory, specifically the Water Element that governs the kidneys, adrenals and bladder. • To help gain a deeper understanding of the importance of aligning with the seasons and natural rhythms of the earth. • To begin to acquire tools for recognizing and diagnosing patterns of imbalance, specifically Kidney deficiency. • To put the lessons learned in this class into practice through dietary and lifestyle recommendations, and herbs that specifically support the urinary tract system and the Water Element. • To learn how to increase vitality and longevity for yourself, your family, and your clients. • To have fun using the methods in this class which include journaling, inner reflection, philosophizing and cooking. Heal and understand your digestive system for optimum health and longevity. This class draws on the wisdom of Chinese Five Element Theory to explain the main functions of the spleen, pancreas and stomach and their relationship to the Earth Element. The Earth Element embodies divine nourishment and abundance and has the power to absorb and transform on both the physical and mental level. There is no better time than now, at the turning of the ages to nourish our Earth Element as we reclaim the sweetness of life and birth a New Earth. This was the year for me to let things go to seed. In the past I was too busy to be bothered with the collecting and storing of seed. Anxious and impatient I couldn’t stand the thought of letting the garden get so unruly. I either wanted to clear the way for a fall garden and greedily harvest right up until the first freeze, or put the garden to bed altogether. But this year I waited. And as I waited and watched the chard took over half the garden until by mid August I harvested enough seed to plant the whole town in chard. I am currently harvesting coriander seed; sweet basil and Thai basil seed, marigold, bush bean, heirloom tomato seed and more. There are also the wild edible and medicinal seeds like lamb’s quarters and primrose. I did well to wait this year and appreciate the power and abundance contained within a seed. There is something very satisfying about saving seed and not needing to go to the store and buy it. It feels rich to gift my neighbors with seed: a promise for a future full of potential. This saving of seed puts me in touch with the cycle of the seasons. I love these seeds rich in primordial oils and containing DNA. The plant devas are all about DNA because they are the keepers of the cellular blueprints and genetic codes. And they were telling me – pay attention in the waning light of summer to the magic in a seed. And so, in the lateness of this summer season – I paused. Late Summer is the season, according to Chinese Five Element Theory, that corresponds with the element of Earth, more affectionately known as Indian Summer. It is the transition point between the yang expansion of spring and summer to the inward yin of fall and winter. The time between late summer and early fall metaphorically speaks to the transition between all of the equinoxes and solstices. It is when the middle way is summoned between the extremes. It is the pause between the in-breath and the out-breath at the change of the seasons when the pendulum reverses its swing. Thea Summer Deer, PhD is a clinical herbalist, singer-songwriter and author ofWisdom of the Plant Devas: Herbal Medicine for a New Earth. Learn more about the Earth Element and Digestive System in Thea’s new class,Indian Summer: Nourishing the Earth Element at Wise Woman University. This class includes four interactive webinars. Visit here for a class overview andfree introductory webinar. The main functions of Spleen-Pancreas and Stomach and their relationship to the Earth Element. Physical, psychological and emotional symptoms generated by an Earth imbalance. Dietary & lifestyle recommendations and herbal strategies that nourish and support the Spleen-Pancreas and Stomach. Considerations of the Earth Element and Spleen in weight management.